On Saturday, Aug. 26, Richland County Farm Bureau will hold its final 2017 Farm to Plate event at the Shelby Farmers’ Market. The featured chef will be Michael Morton from the Ontario Event Center and Brown Derby Roadhouse. Morton will demonstrate different techniques to prepare chicken. His advice for cooking is to learn new techniques and how to exhaust them. For instance, this week Morton will be demonstrating how to utilize the entire chicken. Morton started his career in the restaurant business at the age of 16 at the Brown Derby Roadhouse as a busser. He learned about the different areas of the restaurant including cooking. When Morton graduated from high school, he wanted to further his education and passion for food. He enrolled in Le Cordon Bleu Culinary School in Pittsburgh. Upon graduation from culinary school, Morton began working for the Ruby Tuesday restaurant chain. During employment at Ruby Tuesday, he traveled to new restaurants to train employees for upcoming openings. After leaving the Ruby Tuesday, Morton spent the next few years as the executive chef at Rossi, a fine dining restaurant in the Short North in Columbus. In 2010, he returned to the Mansfield area to be closer to family. He has been the executive chef for Ontario Event Center and Brown Derby Roadhouse for the past seven years. Richland County Farm Bureau approached Morton about the concept of ‘Farm to Plate’ a few years ago. He was interested in the concept because he uses as much fresh produce as he is able from local farmers as well as purchasing produce from the Blooming Grove auction. Two years ago, Morton became one of the small growers who sells some of his own produce at auction (tomatoes, cucumbers, zucchini, and sweet corn). Morton said that since becoming a farmer, he has gained even more respect for farmers with all of the difficulties, especially the weather. He currently enjoys keeping busy with hobbies such as his flock of chickens, making maple syrup, baking artisan breads, brewing beer, making cheese and smoking meats. In the future, Morton would like to start an apiary and raise different kinds of livestock. 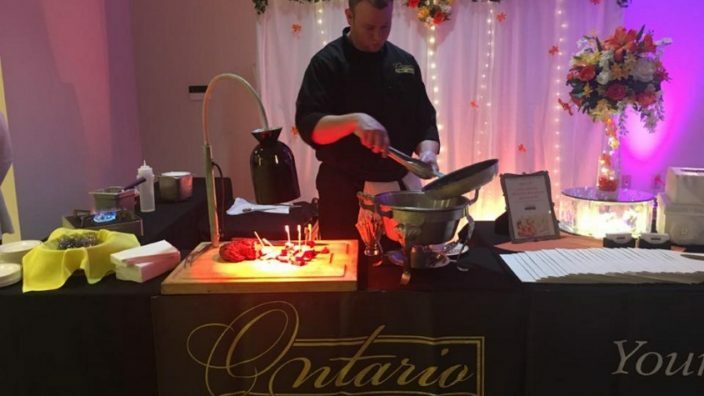 The Ontario Event Center provides catering services for banquets ranging from 25 to 1500 guests, and the Brown Derby Roadhouse in Ontario is famous for their steaks. Both facilities are located at 3985 Park Avenue West, Ontario. The phone number is (419) 529-2959.